After 20 years in the classroom, I retired from teaching to pursue other endeavors. What I miss most of all is working with young students. I began tutoring high school students more than 20 years ago while I was still an undergraduate math major, and these experiences made the call of teaching a discernible entreaty. As a teacher I was an indefatigable early adopter of technology for teaching and learning. In 2012 I developed the first "Flipped Classroom" at my school, and I continued to innovate to adapt pedagogy for the 21st century. I now live in Augusta, GA and serve the CSRA, including Richmond, Columbia, and Aiken County. I hold a Bachelor of Arts in Mathematics, a Master's degree in Finance from the University of Tampa, and a Master's degree in Statistics from Pennsylvania State University. With two decades of tutoring and teaching experience, I am no longer a college student simply helping kids with their homework. With the belief that all students can learn with the right tools and a surge of self-confidence, you (and your child) have come to the right place. Please contact me to learn more about how I can help. With 20 years of teaching and tutoring experience, I am more than just a college student helping students with homework. I taught Advanced Placement Statistics for many years and can offer students tips and tricks to master this subject. With 20 years of teaching and tutoring experience, I am more than just a college student helping students with homework. I taught all high school math courses and can offer students tips and tricks to master any topic. With 20 years of teaching and tutoring experience, I am more than just a college student helping students with homework. I taught high school Algebra 1 for many years and can offer students tips and tricks to master this subject. With 20 years of teaching and tutoring experience, I am more than just a college student helping students with homework. I taught high school Algebra 2 for many years and can offer students tips and tricks to master this subject. With 20 years of teaching and tutoring experience, I am more than just a college student helping students with homework. I taught high school geometry for many years and can offer students tips and tricks to master this subject. With 20 years of teaching and tutoring experience, I am more than just a college student helping students with homework. I taught high school algebra for many years and can offer students tips and tricks to master this subject. With 20 years of teaching and tutoring experience, I am more than just a college student helping students with homework. I taught high school precalculus for many years and can offer students tips and tricks to master this subject. With 20 years of teaching and tutoring experience, I am more than just a college student helping students with homework. I taught SAT prep for many years and can offer students tips and tricks to improve his or her Math score. With 20 years of teaching and tutoring experience, I am more than just a college student helping students with homework. 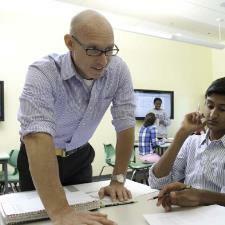 I taught SAT prep for many years and can offer students tips and tricks to improve test scores. With 20 years of teaching and tutoring experience, I am more than just a college student helping students with homework. I taught high school trigonometry for many years and can offer students tips and tricks to master this subject.